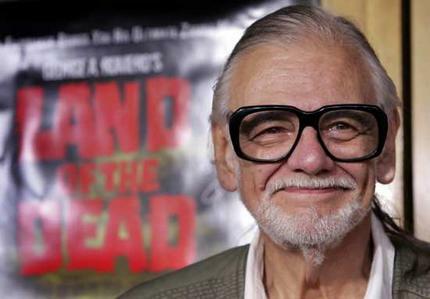 In memory of Filmmaker George A. Romero, I am reposting this interview I had with him regarding the home video release of Land of the Dead and more from 2005. The summer of 2005 has been referred to as the summer of the two Georges because just as “Star Wars” fans eagerly awaited the culmination of George Lucas’ space opera with the feature film release of “Revenge Of The Sith,” horror film fans eagerly anticipated George Romero’s first entry in 20 years in the subgenre he created entitled “Land Of The Dead.” While the two franchises couldn’t be more different outside of the fact that the two filmmakers just happened to have the first name “George,” the fan base for both of these series are fiercely loyal and just as Lucas set the bar for all space opera to follow with his “Star Wars Saga” so did Romero prove once again that although he can be imitated, he can never be equaled. In America critics heralded “Land Of The Dead” as George Romero’s zombie masterpiece and I’ve heard that abroad the anticipation for this film may make it an even greater success globally. I have wanted to interview George Romero for a long time so when the opportunity finally arrived I was psyched. Then a few days before the interview was to take place, the structure was changed from a one on one interview to being one of several journalists in a roundtable style session where I was told each journalist would take turns asking Mr. Romero one question each that way everyone would get the chance to talk to him and collectively given the time allotted, we all would have more or less each had an equal share of questions related to the film answered. Up until now every interview I have ever done has always been a one on one interview between whomever I was speaking with and myself. So I narrowed down my original list of questions to seven and then narrowed it down even more knowing I would not get the chance to ask everything. Romero: Hey that’s real close to me man. I’m Lithuanian and Cuban. Rivera: Absolutely… Okay, I’m going to try and make this as brief as I can. You’ve answered so many questions… First off, with regard to this new film how many years does “Land Of The Dead” take place after the events of “Night Of The Living Dead” and “Day Of The Dead”? Rivera: How many years does “Land Of The Dead” take place after the events that you portrayed in “Night Of The Living Dead” and “Day Of The Dead”? Rivera: It says three weeks in the screenplay. Rivera: Yes. There’s a line in the film where martial law has been declared within three weeks. Romero: Well you know more about this than me. Rivera: Well I am a fanboy as much as I am a journalist. Romero: You know what I can’t even remember that. What was the line exactly? Romero: Oh okay. I know what you are talking about now. I didn’t mean that to be… Well… I guess that does put a timeframe on it. Romero: It’s probably been more than three weeks since martial law. Since they got it together or whatever. Anyway, I’m sorry. (Jokingly) I don’t remember my movies as well as you do. Rivera: (With a bit of nervous laughter) Hey, don’t worry about it… The other question I wanted to ask is with relation to Big Daddy (Eugene Clark), and I just want to say you did a great job with making him sympathetic because I noticed he’s the only featured zombie in the film where you never see Big Daddy taking a chunk out of anybody ever since if you show him doing that then we lose sympathy for him. Romero: Yes that would do that. Rivera: And he is Riley’s (Simon Baker) so to speak undead doppelganger in terms of the heroes of the film. Another journalist asked you about the direction where they’re evolving and becoming more sentient beings like the primitive primate ancestor touching the Monolith in “2001” and suddenly learning how to use tools. My question is judging by Riley’s statement and how the film ends, does it seem to you that ultimately there’s going to be some sort of zombies and humans coexisting in some sort of a peaceful non-predatorial way towards each other? Rivera: Okay and just one last thing. If you were to hand over your franchise. If something were to happen and you wanted another filmmaker to make another entry in your series personally because your films stand out from any other imitation and remake, would you probably hand it over to filmmakers like Simon Pegg and Edgar Wright or John Harrison? Rivera: That’s an excellent film. Romero: I would rather wait another ten years or until something politically changes, which justifies making another one. So I don’t know if I’m going to live that long. What I did in this one consciously was left it open. The only way to end this is with some sort of detent as I’ve said before. So I left it with Riley at least recognizing that. You know, they’re just looking for a place to go same as us. With that my part of the roundtable interview was over. I am very grateful to have had the opportunity to interview Mr. Romero and I strongly urge anyone reading this to seek out using Google or another search engine other recently published online interviews with Mr. Romero because as I mentioned above, this was a roundtable interview and so there are other portions and summaries out there that delve into much of the behind-the-scenes production as well as the upcoming Unrated Director’s Cut DVD from Universal Studios Home Entertainment and more. In addition I should note that Fangoria Entertainment, National Cinemedia, and Universal Studios Home Entertainment will hold a nationwide premiere of GEORGE A. ROMERO’S LAND OF THE DEAD Unrated Director’s Cut, which will be presented in high-definition and cinema surround sound in markets nationwide including New York, Los Angeles, Chicago, Philadelphia, San Francisco, Dallas, Washington DC, Atlanta, Houston, Seattle, Tampa, Minneapolis, Phoenix, Cleveland, Miami, Denver, and Pittsburgh among others. Tickets are available online at www.Fangoria.com or at participating Regal, United Artists, and Edwards movie theatre box offices at the standard movie ticket price (prices vary by theater location.) For a complete list of theatres, please visit the website. This special premiere event will also feature an exclusive big screen interview with Director George A. Romero. Big thanks to George A. Romero for graciously answering my questions as well as everyone else’s who participated in the roundtable interview and special thanks to Tom Chen and Debra Park at mPRm Public Relations and Craig Radow at Universal Studios Home Entertainment for arranging this roundtable interview for everyone who participated and for letting me join in too.